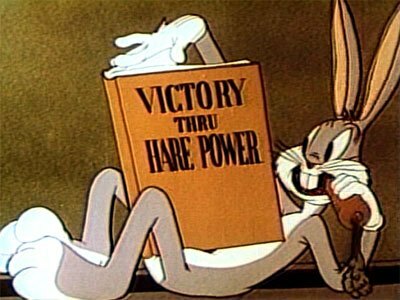 This is really a MISCELLANY post, but I couldn’t resist using this post title, (a) because I’m a Bugs Bunny fan (is there anyone who isn’t? ), and (b) because I happened to chance upon both of the featured bands yesterday, and their names are Rabid Rabbit and dropbunny. Since this is a MISCELLANY post, I picked these bands to feature without hearing their music first. Once I make that choice, the self-imposed rules of MISCELLANY require that I forge ahead in writing about the selected bands even if the music turns out to be something I wouldn’t normally recommend. To be brutally honest, with names like Rabid Rabbit and dropbunny, I didn’t really expect to dig the music. I would have been more optimistic if they’d been called Rabbit Viscera and fuckbunny. Anyway, here goes! Bruce Lamont is probably best known for his vocal and saxophone work with Chicago’s Yakuza, though he has recorded with dozens of other bands over a prolific career. Rabid Rabbit is one of those bands. At the core of Rabid Rabbit is the husband-wife team of Andrea Jablonski (vocals/bass) and Mike Tsoulos (drums), and they’re complemented by Arman Mabry (bass) and new guitarist Dan Sullivan on the band’s forthcoming second album, Czarny Sen (which means “black dream” in Polish). 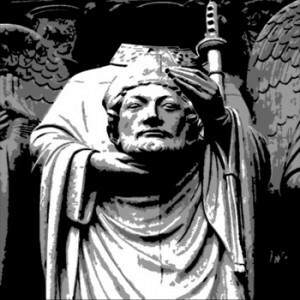 Lamont makes a few guest appearances on the album, as do a variety of other musicians from Chicago’s noise, metal, and free-jazz scene. Or at least that’s what I learned from the press release I received recently. 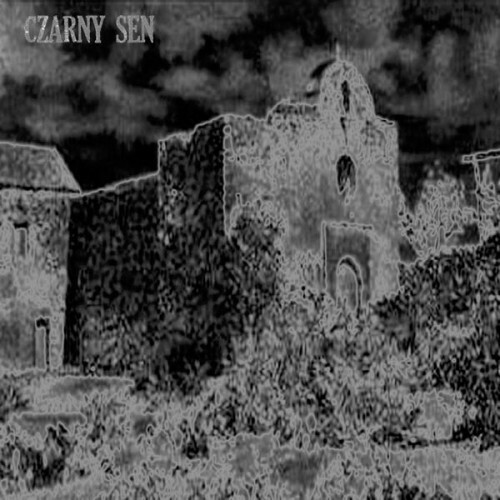 Czarny Sen, which will be released by Bloodlust Records on December 6, consists of five long songs, topping out with “Suicide” at almost 12 minutes in length. Two of the songs (“Suicide” and “Goliad”) are now available for download as singles via the Rabid Rabbit Bandcamp site. Under the usual rules of MISCELLANY, I only listen to a song or two from each selected band before reporting the results and moving on to the next pick. So, although I was allowed to hear the whole album by the band’s PR supporters, I limited myself (for now) to those two tracks, since anyone can now stream (and buy) them. I started with “Goliad”. When I was a brat growing up in Texas, I learned about Goliad in a mandatory Texas history class. During the revolution that eventually resulted in the independence of Texas from Mexico, a garrison of Texian insurgents was defeated and captured by the Mexican army, and under orders from Mexican commander Santa Anna, almost all were executed (342 men) in what became known as the Goliad Massacre. I don’t know what prompted Rabid Rabbit to build a song around that event, but so they have. “Goliad” starts slowly, with methodically pounding drums, a funereal bass line, ringing guitar chords, and Andrea’s chanting clean vocals. Gradually, the music becomes more active, the bass groaning with a deep, sucking sludge noise and the lead guitar spinning out in an extended psychedelic solo before a refrain of the opening measures. Kind of a doomy shoe-gaze. “Suicide” uses lyrics from an old “torch song” called “Gloomy Sunday”, which was composed by a Hungarian named Rezső Seress and was made famous through a 1941 recording by Billie Holiday, singing English lyrics written by Sam Lewis. The lyrics refer to suicide, and the composer eventually did kill himself (a lot more fascinating history about this song can be discovered here). The pacing of “Suicide” is no faster than that of “Goliad”. It crawls like funeral doom, with plodding drum-and-cymbal crashes and thudding bass chords. Squealing, feedback-enhanced guitar notes, rambling sax riffs, and other strange electronic sounds overlay the trudging rhythms as the song lumbers ahead. I found my head starting to bob as the song crossed the mid-point and the heavy sludge factor increased, with Andrea’s vocals pairing up with a harsh male growl and the lead guitar and sax pairing up in a freaked-out outro. This kind of crawling, pared-down, psychedelic, doom-sludge isn’t my usual drink of choice, but I did find myself drifting into a hypnotic haze and wondering what my blood would look like dripping from a shallow, self-inflicted wound. I came out of it before reaching for a knife. Later, I found myself humming the melody from “Suicide”. 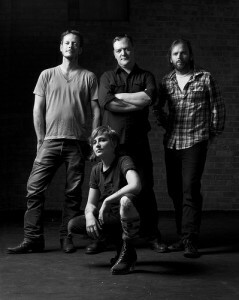 dropbunny is a seven-piece band from Melbourne, Australia. 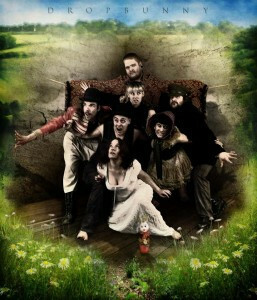 As in the case of Rabid Rabbit, they have a second album staged for release. It’s called IO, and it’s scheduled to become available on January 28, 2012, via iTunes, Bandcamp, and the dropbunny web site. According to the press release I received, “dropbunny supplement their crushing guitars, mind-bending rhythms and roaring vocals with violins, sitars, xylophones and electronics, including ad-hoc instruments made from rat traps, fish tank motors, and a power saw.” So, you can see why I was attracted to this (in addition to the band’s name), right? dropbunny have released a four-track preview of the album at http://www.dropbunny.com/IO.html. Four tracks sounds like a generous preview, doesn’t it? It may help to know that the album consists of 18 tracks. I decided to bend the MISCELLANY rules and listened to all four of the preview tracks: “Plummet”, “Irredeemably Fucked”, “Another Lost Kid”, and “Pentagonal Plywood Prison”. “Plummet” features caustic harsh vocals, clattering percussion, demented guitar slashing, and a vicious bass line. Actually, everything about the song is demented. “Irredeemably Fucked” builds itself around a head-snapping lead riff, with clean vocals trading off with more of those crazed harsh ones. The music is somewhat less off-the-hook than “Plummet”, but still with the flavor of something unhinged and unpredictable (and the guitar riffs are quite cool). The intro to “Another Lost Kid” is a start-stop affair that then settles into a bass-driven rhythm and another catchy series of furious guitar riffs, with another clean/harsh vocal mix. I like the bass grooves and the barreling drums in this song as it nears the end, and the guitar riffing is again groovy throughout. “Pentagonal Plywood Prison” is also bass-and-drum impressive, initially more melodic than the previous three tracks and with even greater vocal variety as female singing joins the schizophrenic male vox. The ringing guitar chords in the early part of the song made me long for the hard-charging riffage on the last two songs, but that eventually came as the song ramped up into a satisfyingly howling squall. P.S. You can download dropbunny’s debut album, Hypothesis, for free at their web site, here, along with those four preview tracks from IO.